The personal site of Rio based Information Architect Ricardo Saavedra. Ricardo has used new HTML5 elements such as section well, and has used div where appropriate to create a nice document outline. He has also removed the type attribute from script elements (apart from the analytics ones), and could also do so for the stylesheet link element. 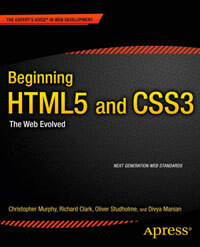 I’m really glad to be remember in this collection of html5 websites. Thanks a lot!